In GOD OF WAR, the dark brutal world of Greek mythology comes to life before your eyes. As you take the role of Kratos, a story unfolds with various plot twists and multiple endings that take the player through explosive, aggressive gameplay fused with traps, stunts and story driven puzzles. 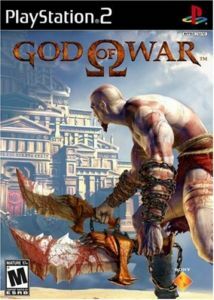 Featuring an hour of cinematic sequences and a deep combat system built around unique double chain blade weapons, GOD OF WAR will take the player through various environments that will have them fighting fierce enemies, swinging on ropes, scaling mountain cliffs, swimming through rivers and sliding down zip lines resulting in a one-of-a-kind action-packed Greek mythology adventure. GOD OF WAR introduces a brutal slice of life set in the mythological Greek era. Players can live according to their own nature. Even if it is by brute force. Huge collection of moves: players can swing on ropes, scale mountain cliffs, swim through rivers, slide down zip lines. 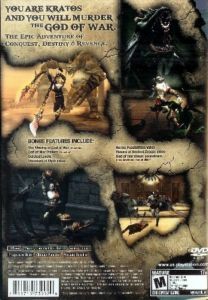 GOD OF WAR delivers an extensive combat system based on uniquely linking combos for a myriad of fighting moves. Take the combat in air, take out a number of enemies at once, and utilize "context sensitive moves" - moves that in particular situations, allow you to grab, kick or throw an enemy. Kratos' main weapons are two blades ¡V one attached to each arm by a long chain that wraps around his arm. This allows for both short-range and long-range attacks. Unleash an innovative magic system that grants the power of gods and monsters: use Medusa's head to freeze your enemies, strike them with Zeus' thunderbolt, cut them down with Ares' blades. Explore and unravel numerous puzzles that range from simpler lever pulls to the most mind-bending, sadistic twisters around. Players can experience a real-time world of interactivity: soldiers battle and die, structures fall to the ground, and the dark, violent world of Greek mythology comes to life in gory detail. From the creative director of the Twisted Metal and Twisted Metal:Black franchise.